The new blood-thinner medication Xarelto (rivaroxaban) has been linked to serious internal bleeding injuries. These bleeding events can occur suddenly or within a few days after taking the drug and can be catastrophic causing death. Are you looking for a Xarelto Brain Bleed or Gastro-Intestinal Bleeding Attorney in Florida? Do You Live in Miami, Orlando, or Jacksonville, and Want to File a Florida Xarelto Bleeding Lawsuit? With Xarelto, there is no way to reverse the blood-thinning (or anticoagulation) effects of the drug. This can cause some patients to suffer uncontrollable and sometimes fatal bleeding events. Lawsuits allege that the manufacturers improperly promoted Xarelto as superior to warfarin (an older anticoagulant) because Xarelto is taken orally once a day and does not require blood monitoring. Warfarin has an antidote to stabilize and treat bleeding emergencies but Xarelto does not. Medical studies have found that Xarelto has an increased risk of bleeding compared to placebo. 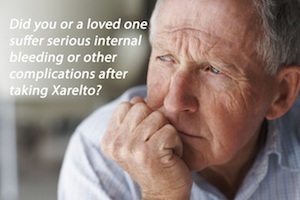 Injured by Xarelto What to Do Next? The first step with any Xarelto injury or wrongful death claim is to receive an case evaluation and discuss your legal options. We represent our clients on a no-fee, contingency basis and provide all consultations at no cost. Please contact our office today at (888) 210-9693 or through our online form to learn how we can help.